A while back, my friend Kristin and I painted some chalk paint labels. We followed this tutorial from Gemma over at the sweetest digs. I met Gemma briefly back at the Target event- and love her blog! 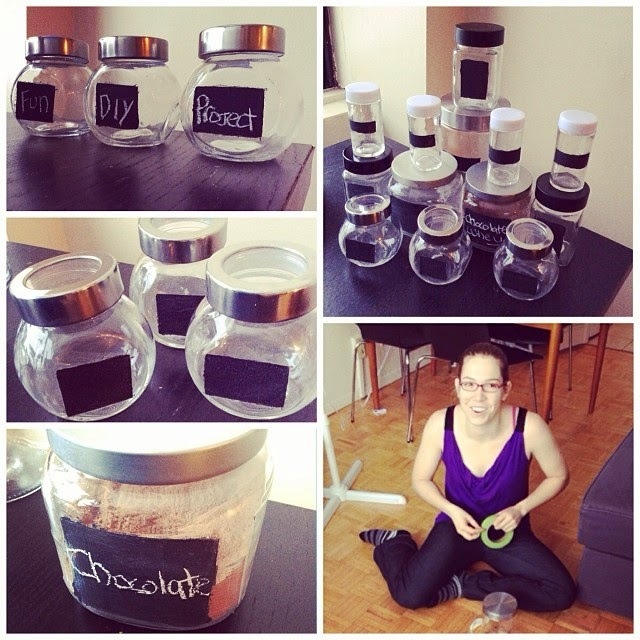 She has a lot of great DIY projects so check it out if you are looking for new ideas. She also has a lot of tips on parenting and travelling with a baby etc. which are great for those with brand new babies. Anyway the chalk paint project turned out great! These jars pictured above are mostly from the dollar store with a few from Ikea. I also have some from Bulk Barn. In those photos the labels are written in chalk, but it actually looks a lot nicer with chalk markers. Also it doesn't rub off as easily, but does come off with water. I bought a pack of 4 chalk markers at Michaels. They come in different colour pallettes which is fun! I think that white looks the best. They cost about $11. The price is a bit steep, but print off a $40% off coupon from Michael's weekly coupons, and you are good to go! I loved how the jars looked, but still had many jars without labels. I am a frequent shopper at bulk barn and often buy stuff only to completely forget what it is, so this is definitely a problem for me! I considered buying some of the Martha Stewart chalk labels (they have them at Staples) but at $5 for a pack of 3, this would get expensive. I decided, why not paint plain Avery Labels with the chalk paint and use those? I still had almost a full can of chalk paint (which I had lent to my friend Carolyn) and had some labels lying around too. So this past weekend, I was up visiting Carolyn and her hubby and we got to work. Setting up- making sure to cover the table with newspaper! It was fun, and the labels turned out great! It is pretty self explanatory- we just painted 2 coats of pain on the labels (paint one coat, wait about 10-15 minutes, paint the next coat). After a few hours they were dry enough for me to bring them home. I let them dry more over night and then "cured" them with chalk. You just rub the chalk sideways onto it, wipe it off and repeat. This makes it so that when you write on the label and erase it, it doesn't leave an imprint. and Voila the final product on jars in my cupboard! As you can see there is still work to be done in terms of putting things in jars and labeling them. I see a lot of name-less baggies in there.. Luckily I have lots of labels left, so hopefully I will tackle the rest soon! If you need labels for your pantry, try this out!